Yesterday, I was doing an interview for some client work. 30 minutes, me and a stranger in a corporate conference room. I asked how her morning was going, and she said she was having a hard day. Then she said, "When I go home at night, there's my daughter and a new puppy to play with, and I remember what matters. This is just work." She teared up a little and, since my tear ducts are connected to everyone else's, I teared up too. I thought of her today, making this CRAZY sugar-packed Halloween treat. I had one of those days that makes me feel nuts--"home" with the kids, but forcing Loretta to take a nap so I could make my conference call in time, distracted and anxious, wishing the day had 12 more hours in it but wanting it to end all at the same time. Then Wyatt came home from school, the promised Halloween treat-making ensued, and I HAD to stop what I was doing, be present to them, and remember what really matters. Of course, it all matters, even the small stuff we're not supposed to sweat. Don't you hate it when people tell you not to sweat the small stuff? If you're sweating it, it's probably big. But there are some things that matter more than others--my seven-year-old sidling up and rubbing my back, my preschooler snuggling with me in the morning, destroying the kitchen by smashing up peanut butter cups and getting chocolate everywhere. The rest? It's just work. Adapted from Bon Appetit. You could, of course, use so many other things on top of the chocolate--nuts, coconut, different kinds of candy bars, pumpkin seeds, dried fruit. This, clearly, favors the preferences of children, for whom absolutely nothing can be too sweet. I won't tell you how much I ate after they went to bed last night. All candy bars are the "regular" size--not king size or mini. Line a baking sheet with foil. Heat chocolate chips in a double boiler over barely simmering water, stirring frequently, until melted and warm (not hot) to the touch. Pour chocolate onto foil; spread to 1/4" thickness (about a 12"x10" rectangle). 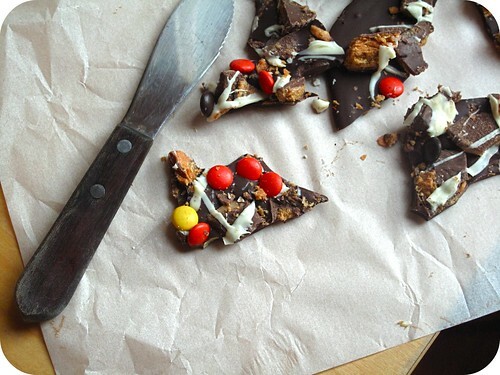 Sprinkle with butterfingers, toffee, and peanut butter cups, making sure everything sticks to the melted chocolate. Melt white chocolate in a double boiler over barely simmering water, stirring frequently, until melted and warm (not hot) to the touch. Remove from heart. Dip spoon into chocolate, wave from side to side over bark, creating zigzag lines. Scatter Reeses's Pieces over, making sure it sticks. Chill bark until firm, about 30 minutes. Cut or break bark into irregular pieces.